Songs We Love: David Bazan, 'The Ballad Of Pedro Y Blanco' The final track on David Bazan's enveloping 2017 album, Care, is the story of an intimate relationship told over decades. David Bazan's Care is out now. 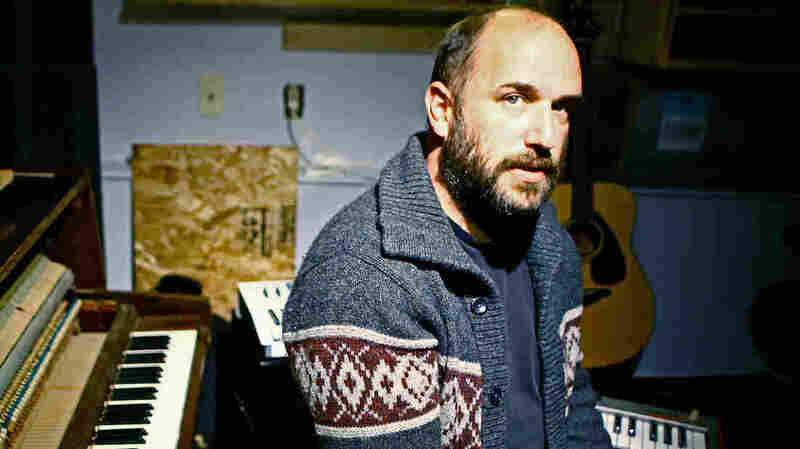 It's easy to take David Bazan's music for granted, or to turn away from it. For two decades, first as Pedro the Lion and then under his own name, he's been making songs that quietly pick apart doubts, miscommunications and personal failings in order to expose soft truths about human struggle. He's both singular and reliable, and within a narrow but potent vein of subject matter and style, he's an explorer. Whether his subject is the flaws in the stories we tell each other, the existence of the divine or the fragility of relationships; whether writing songs for a rock band or for electronics; his songs feel like conversations with a trusted friend ready to share what he's working through. It can be hard to listen carefully if you're not ready for an accounting of personal inconsistencies you'd rather ignore for now. He draws you close. Care, Bazan's enveloping 2017 album, continued his recent swerve into synth-based music with its sights set on partnership, parenting and other issues of domestic life, including — crucially for him — the creation of art. It's easy to imagine this mid-career shift as the result of sharing a family space: You can make tracks on headphones, and the music can reflect the clarity and sustained turbulence of a life that's settled but newly terrifying in ways that the percussiveness or distortion of a guitar can't. Much of Care deals with moments that don't feel make-or-break but accrue weight. Friends split up. Stress from work throws off the balance of an alliance. There's only so much time to spend together after the kids go to sleep. But the subject here, as with the rest of Care, is making commitment work, and the relationship survives kids, stress, busy schedules, resentment, retirement and grandchildren. The track, filled with a swirl of chimes, ticks and astral squeaks, lends "The Ballad of Pedro y Blanco" a feeling of myth-making, except Bazan's lyrics are more like the narration of a family photo album your parents would never actually provide. When I first heard Pedro the Lion, I was a teenager, thinking about how I might make my way apart from my family without losing what I learned from it. I've orbited back to Bazan's songs many times in the 20 years since, often in need of something steady and centering but not rehearsed. I'm a parent now, and more often than I ever expected, find myself trying to spin hurt or confusion or minor injustice into something meaningful. It's a small thing, but it's deeply reassuring to know he's out there working through these issues too, and sharing what he's learned. Care is out now via Undertow.